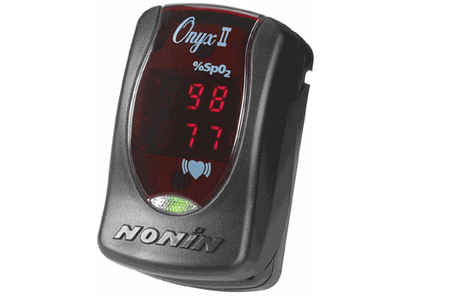 The PIN code is found on the side of the Onyx II device. Begin the pairing process with the Onyx II powered off. Remove the batteries from the Onyx II. Put your finger into the socket of the Onyx II to clear the capacitors. Remove your finger from the socket and replace the batteries. 5. Return your finger to the Onyx II’s data socket. After a few moments a ‘toggle’ should appear on the side opposite the heart rate and 02 labels. The Onyx II should be pairable.